I admit it – I got the Fairy Wedding bug. No, not the Charles & Diana wedding bug, or the more recent William & Kate or the Kim & Kris wedding bug (I’d pay YOU to remove the People magazine footage of that debacle from my sight! Celebrity whores have you no shame???). 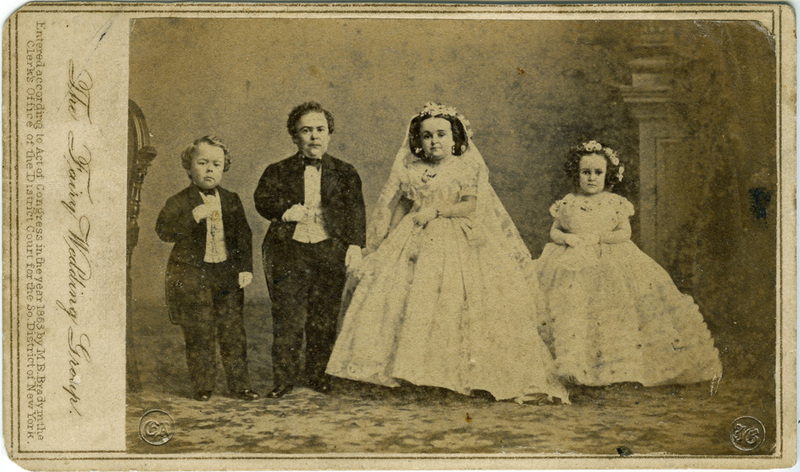 But I digress – I’m fixated on the ORIGINAL celebrity wedding photos: the marriage of Tom Thumb and Lavinia Warren, photographed by THE American celebrity photographer, Mathew Brady (yes, Mathew with one T), and stage managed for maximum publicity by P.T. Barnum, the original master promoter and co-creator of the circus that still bears his name. 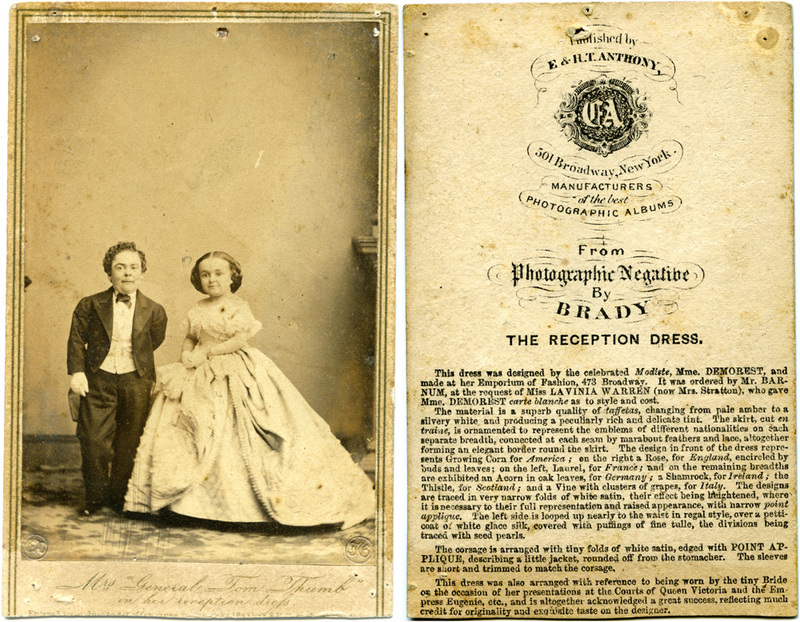 Here is the follow-up to one of my earlier images of Tom and Lavinia in their wedding ceremony outfits. This one is the dress she wore to their reception with the 2000 guest receiving line where they stood atop a grand piano at the Metropolitan Hotel. Another, odder wedding souvenir card. 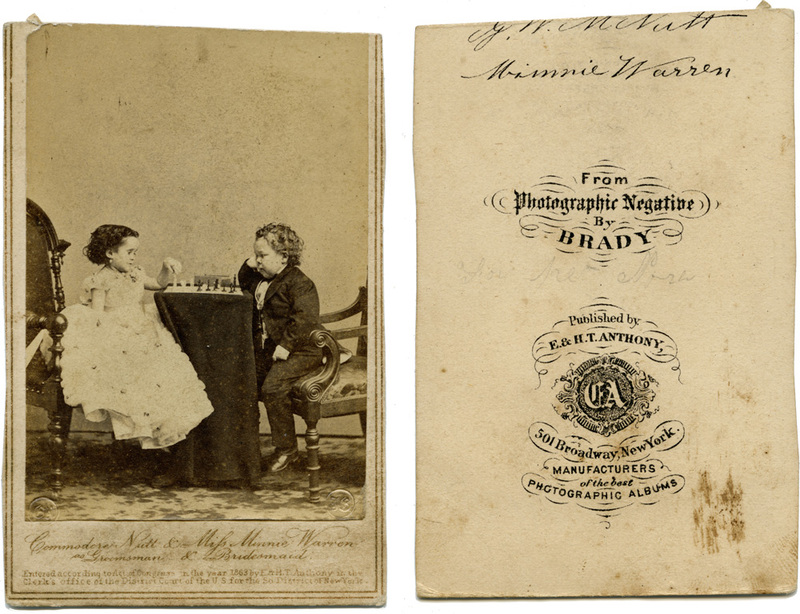 This one features George Nutt and Minnie Warren, Lavinia Warren (Mrs. Tom Thumb)’s sister and later George’s wife, playing chess. 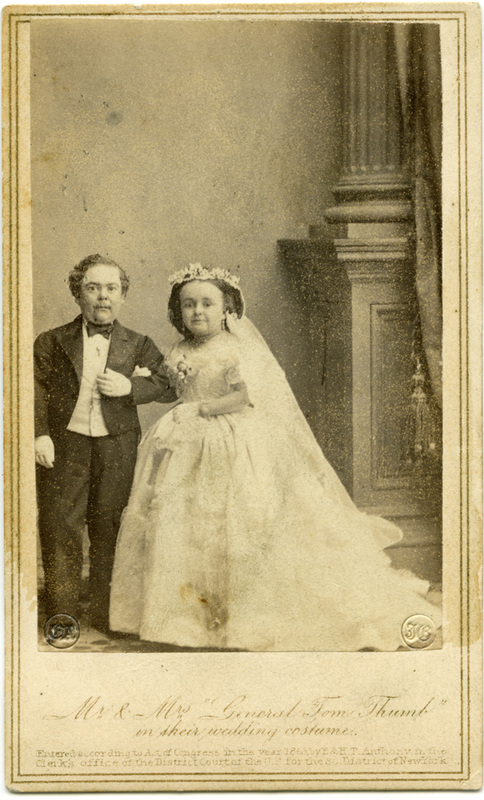 What this had to do with the wedding is beyond me, but it obviously catered to some 19th century sensibility – perhaps the suggestion was that they had outsized brains in their diminutive bodies, further exaggerating the curiosity/freakish attraction to a customer looking for a spot of distraction from the civil war raging around them in 1863. 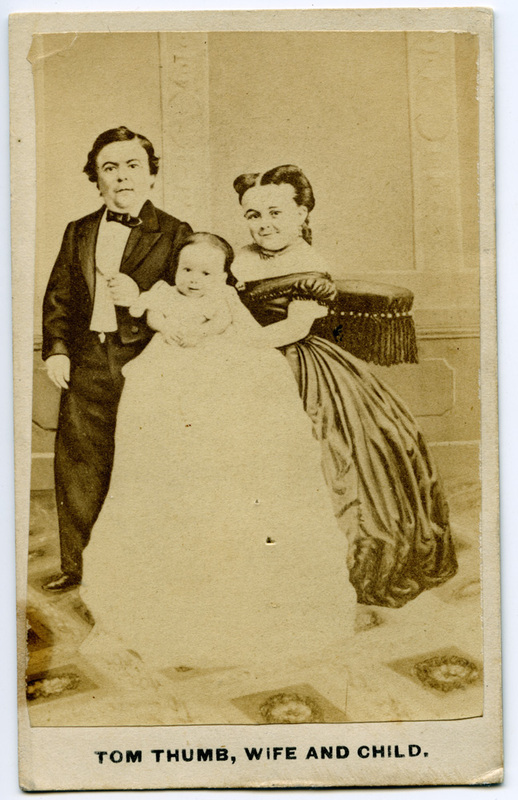 Tom Thumb, Wife and "child"
This image, undated and uncredited, is from some time later, possibly in the 1870s. 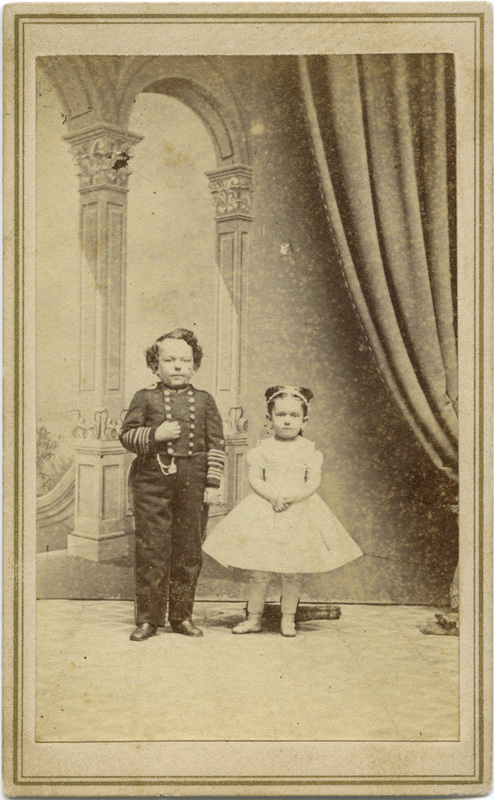 Charles and Lavinia Stratton were not able to have children of their own, so P.T. 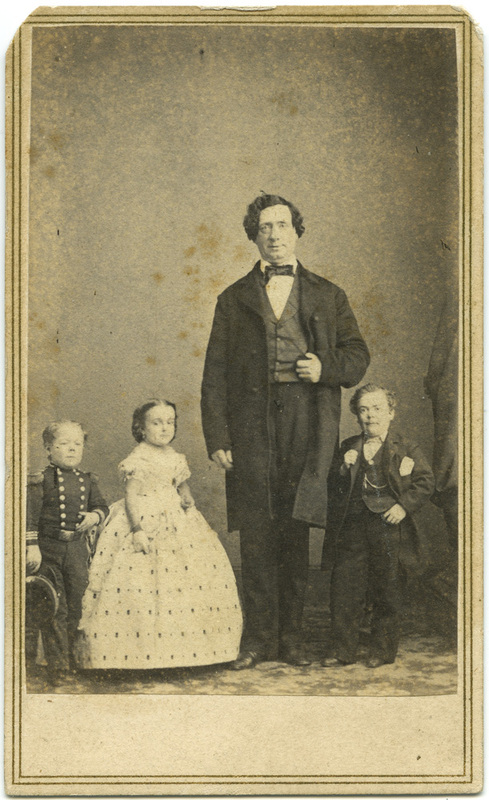 Barnum, ever the showman, would acquire an orphan baby and give it to them to portray as their own, and when the baby got too big, he would find another one. Apparently, as a result, they “had” a one-year old baby for the better part of a decade. As a memory refresher, here’s the rest of the gang in thumbnails. They had a very beautiful baby. I wonder if she/he grew up to be much taller than both parents? 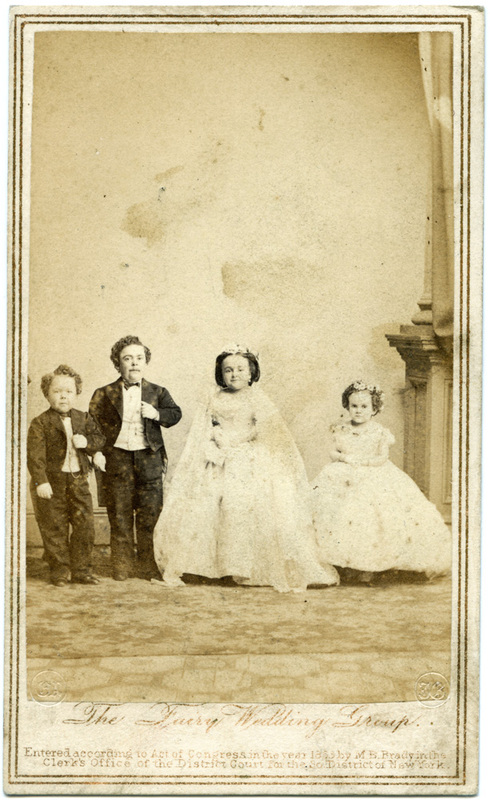 So, I guess I am wondering if their size was hereditary? 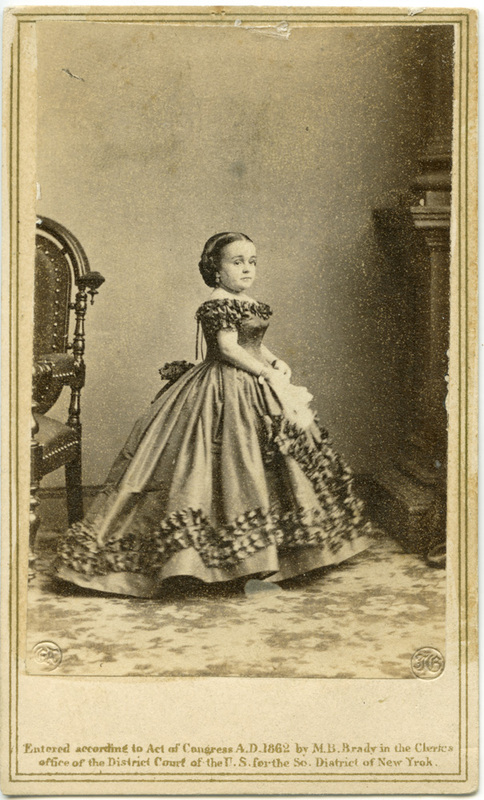 It was never their baby – Lavinia Warren was incapable of bearing a child, so it was a “loaner” for stage purposes. OMG, I am so sad for them! And so having suspected the marriage was a fake (you enlightened me on that) which didn’t worry me at all, I am now devastated that the baby was!! Strange world!